At the University of California, Irvine, I sought to generate a foundation for knowledge about social interactions in co-local space. Namely, I was interested in how technology could utilize body movement to engage a person to become aware of and more likely to interact with other people in their immediate environment. Below, I've included some writing and projects from when I was a PhD student in the Informatics program at UC Irvine. Prior to leaving the Informatics program, I was awarded the Fischer Memorial Fellowship for outstanding doctoral research. Technology has developed to become a medium for communication. Instant messaging and voice-over-Internet softwares like Skype have developed to allow people to communicate remotely in real-time; similarly, popular social media sites like Facebook and Twitter enable people to communicate at different times and without the shared use of space. However, face-to-face interaction continues to be the easiest format for social connection. In fact, some scholars have surmised that current technologies that allow communication without face-to-face interaction enables a decrease in socialization. Seeing that technology has the power to disengage a person from interacting with other people in his/her immediate environment via human-computer interaction, I ask: In the future, will technology have the power to engage a person to become aware of and more likely to interact with other people in his/her immediate environment, by means of what may be described as human-computer-human interaction? As gestural computing and movement-driven interfaces continue towards ubiquity, embodied use of such technologies may bring about changes in user behavior and interactions in co-local environments. Despite the interactive qualities of many emerging technologies, the majority of such technologies are unable to respond to and represent the user’s knowledge of their body moving in relation to the socially constructed place they inhabit. how audience response is valued and evaluated through the performance. In an increasingly technology-led society, the embodied use of devices (e.g. laptops, ipads, smart phones) has brought a change in the behavior of people and their interactions in co-local environments. The interaction a user has with her device is that she interrupts an awareness of her immediate environment to effectively use them. These devices are interactive, but do not respond to the space that the user inhabits, and forces her to bring her entire focus to a screen for interaction. She glances at the GPS map for navigation while driving, she texts under the table during an outing with friends, she watches a video online while crossing the street. The devices are unable to respond to and represent the user’s basic surroundings and the knowledge she has of her body moving in space. To a large part, this is because of the user's gestural knowledge (the user's knowledge of their bodies, their physical space, and the content and form of their collective motions) is tacit. A user does not need to elucidate or express that knowledge they has of themselves to their immediate environment because it is a basic epistemology for them - those gestures perform vital translational functions between their environment and the operation of their mind. However, gestural input, embodied computing, and embodied data and knowledge presentation and interaction are emerging as more available and vital in the technology of design and information spaces. In a world where technological devices are fully integrated with a person’s physical space, his movements and gestural commands for interactivity and expression of engagement for human-computer interaction extends into the activities he conducts in co-local environments with and about other people. His embodiment of gestural input, data, knowledge presentation and computing are challenged by his interactions with other people, who identify patterns of his physical behavior differently than any of his personal and public computing devices. The study of how physical knowledge is information transferred, gained or lost in co-local environments requires a focus on human movement analysis within information science. The production of embodied knowledge by joint curation of a co-local dance improvisation is the practice of incorporating physical knowledge as design infrastructure for co-locally inhabited environments. Traditional conference and concert venues (performing arts arenas, movie theatres, lecture halls) are made to allow an audience to sit and watch a production, performance or display, often for hours at a time. The audience’s presence at these venues is mediated by a seating arrangement that separates them from the show. Rather than a venue that responds to the bodies and physical presence of the audience, these venues expect the audience to be static. It is not important whether a member of the audience squints and leans forward to see the show, or whether someone sits for too long and his or her leg falls asleep. The setup of such large venues does not require the audience to express their knowledge of their body, of whether they are comfortable and expressive of movements sensible to that individual. The production that the audience sees at such a venue is clearly related to the formal layout of the space because the common theatre venue that houses several hundred situated audience members provides a physical structure of presentation and performance legitimacy. One’s attendance at a performance in a seated theatrical venue is different from being a part of a production that invites the physical participation and movement of bodies, and recognizes bodily knowledge as a method of engagement. A curation of dance performance with improvisation as the subject, theme and method for engagement between audience-participants and performers is a production of bodily expressions by way of co-local interaction. Since the conceptual framework of such a production is more important than the characteristics of the performance or behavior of audience members, the performance is self-reflexive and authorship of the performance is redistributed across the audience-participants and performers. The audience is invited to become participants in the production of the performance, which is both their space and material for engagement, and their embodied experience in the performance becomes a part of the production they consume as product. Dance curation contextualizes the role of the participant to the role of the researcher by creating a fundamentally co-constructed experience. The information the participants receive in having partial control over the intent and response of their co-local peers is directly related to the exploration of embodied knowledge as knowledge infrastructure. Since the word “dance” may imply a level of dance mastery or technique, the curation of a dance performance as a medium to exemplify daily human movement may seem audacious or unrelated. However, the term dance and the notion of dance curation are not to imply that the participants of a curated dance performance are moving at a level of technique meant for entertainment. Here, the word “dance” is used loosely to describe any particular sequence of steps and movements that imply physical expression. 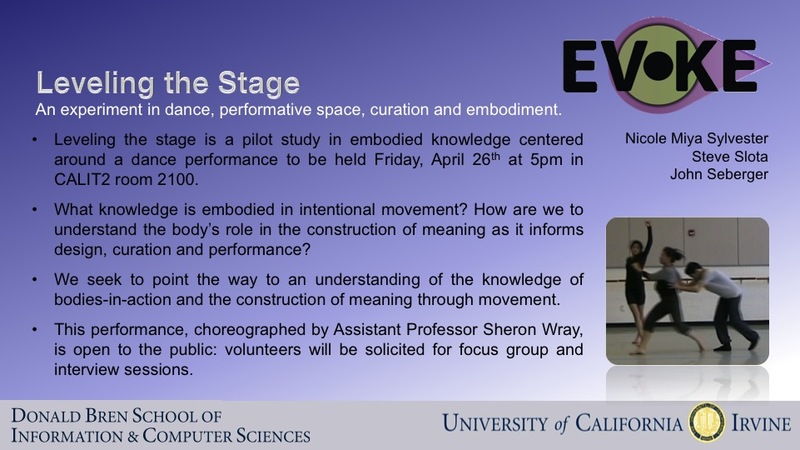 The study of embodied knowledge through dance curation generates a foundation for a knowledge infrastructure of how the body moves and can move in space. As a generative performance of bodily knowledge and expression, our study seeks to ground research in human-computer interaction in the co-construction of human movement. The audience for the proposed project includes a variety of academic communities, including researchers in Human Computer Interaction, Computer Supported Collaborative Work, Ubiquitous Computing, Dance & Technology, Dance Improvisation, Laban Movement Analysis, and Design. 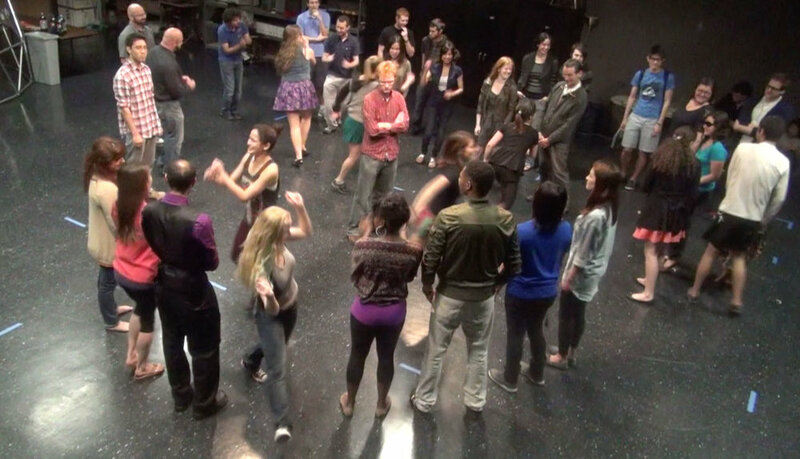 Audience members and dance performers comprise the sample of participants involved in the present pilot study. Such participants will be drawn from the audience and dancers participating in a co-located improvisational dance performance sponsored by the EVOKE lab. Size of the sample in question is projected to be 15 to 28 participants. Dancer-participants will be recruited through scheduled meetings in the dance department. Such recruitment methodology is similarly one of convenience sampling. Identifying information will necessarily be collected in order to facilitate the execution of follow-up interviews subsequent to the rehearsal and performance phases of this study. All such identifying information will be destroyed following completion of data collection. 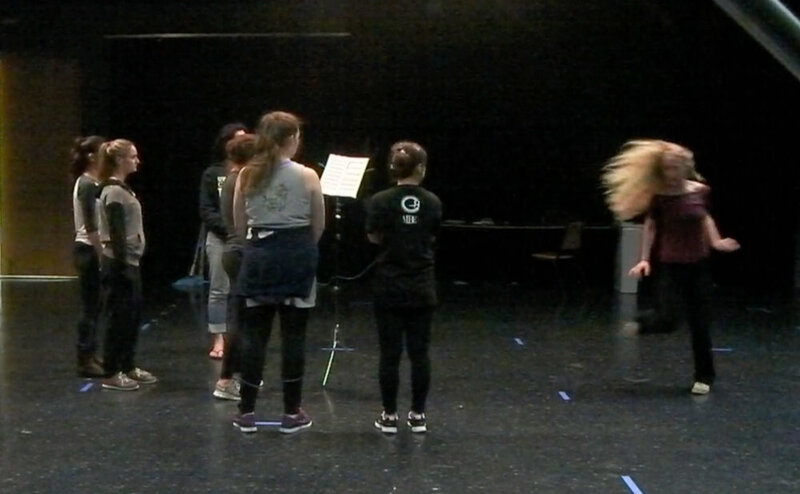 The style of dance improvisation put into practice for the dance rehearsals and performance has been developed in part by Sheron Wray, Assistant Professor of Jazz Dance at UCI. Wray’s model for bodily expression builds upon Jazz Dance, which is characterized by the choreography of a framework from which to improvise within, and her objective is unique in that it she merges the space inhabited by the audience and performer as a single, porous dance improvisation. The first sampling and data collection will take place during the course of rehearsals prior to the performance. Dancers will participate in two rehearsal sessions prior to execution of the formal, public dance performance. Rehearsals are to take place in the dance studios at the Claire Trevor School of the Arts. Each rehearsal session will be videotaped. Rehearsals will be scheduled for one to two hours. Following completion of each rehearsal, dancer-participants will have the option to participate in a focus group session (not to exceed forty-five minutes in duration). Focus groups will be audio-recorded and will focus on applying narrative and analytic thought to the expressive process of improvisation in dance through talk-aloud protocols and interview. Any identifying audio information gathered during such focus group sessions (e.g., the use of names) will be replaced with pseudonyms during the transcription process. Additional field notes will be recorded by the researchers listed at the top of this document. Following completion of two rehearsal sessions, volunteer dancer-participants will participate in a public performance. Such performance will be videotaped, as is common in dance performances. Individuals, both participants and non-participant audience members, pictured in the video will not be identified. On the night of the performance, participants drawn from the audience will be asked to record short narratives describing the performance (audio recordings). The person speaking on these recordings will not be identified. Such short narratives will be collected in the same space used to house the performance and will be collected by the researchers listed at the top of this document. Audience participants will be asked to complete a voluntary short survey prior to the commencement of the performance. Participants, both dancer and audience members, will participate in one follow-up interview in the weeks subsequent to the public performance. Dancer-participants will participate in a group-style focus group comprised of all dancer-participants. (Due to the relatively small sample population of dancer-participants, there is no need to segregate into multiple groups.) Audience-participants, on the other hand, will participate in one-on-one interviews. In order to ensure participant privacy, all follow-up interviews (including the dancer-participant focus group) will be non-public. Furthermore, such interviews will be scheduled as convenient for participants. Follow-up interviews protocols (including the dancer-participant focus group) will be semi-structured and consist primarily of a talk-aloud protocol where participants will be asked to generate a narrative of their experience of the performance. The duration of follow-up interviews is planned for 30-60 minutes. Interviews will not exceed 90 minutes. Volunteers recruited from the initial pool of participants will return in several months for a final interview session where they will be shown the analysis, and be asked to go through the talk-aloud protocol and describe the dance one final time from the video. All data collected via audio and video recording (e.g., interviews, post-performance short narratives) will be transcribed and de-identified through substitution of pseudonyms and the redaction of any identifying material. Data in its original, participants-identifiable form will be stored on a separate hard drive in the form of encrypted files. Transcribed data will be analyzed through a combination of content analysis and simplified grounded theory. The execution of the analysis will consist of the development of individual coding schemas by the members of the research team.